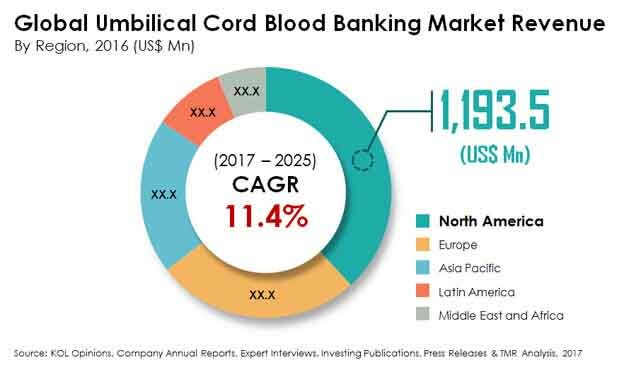 The global umbilical cord blood banking market features a markedly fragmented vendor landscape characterized by the presence of a copious number of small players. The combined share of the leading three players is merely 7.0% of the global market, finds Transparency Market Research (TMR). Over the years, the anticipated proliferation of private cord blood banking companies is likely to up the level of competition. TMR, however, observes that the high degree of fragmentation notwithstanding, the market is strictly regulated both by regional and global legislations with an aim to promote better therapeutic use of cord blood. Prominent players operating in the umbilical cord blood banking market include StemCyte Inc., LifeCell, Vita 34 AG, Cordlife Group Ltd., Cryo-Save AG, Cryo-Cell International, Inc., Cord Blood America, Inc., China Cord Blood Corporation, ViaCord Inc., and CBR Systems, Inc. The global umbilical cord blood banking market is projected to rise at a promising CAGR of 11.4% during 2017–2025. The market stood at US$3,124.4 million in 2016 and is prognosticated to touch a valuation of US$8,178.1 million by 2025 end. The primary types of storage under umbilical cord blood banking comprise public and private banks. Private cord blood banks is by far the dominant segment and contributed a substantial share of 65.0% in the global market in 2016. Notwithstanding the exorbitant initial cost and the consecutive costs incurred for their services, the popularity of private cord blood banks isn’t likely to wane anytime soon. The segment is expected to hold its sway throughout the assessment period. On the regional front, North America leads the global market accounting for a marked share of 38.2% in 2016. The regional market is expected to retain its dominance and rise at a prominent pace over the years. This can be attributed to the enormous demand for umbilical cord blood primarily for stem cell research in key economies of the region. The profound regenerative potential of these blood-forming stem cells in the treatment of a wide spectrum of disease conditions, especially various blood-related disorders, and in hematopoietic stem cell transplantation (HSCT) is a key underpinning fueling the growth of the umbilical cord blood banking market. The rapid stride made by hematopoietic stem cell transplantation, notably pertaining to bone marrow and peripheral blood, in various parts of the world is a notable factor driving the market. The growth of the market is driven by vast current and emerging potential applications of cord blood in immunotherapy, regenerative medicine, and tissue engineering. Umbilical cord blood considered as a potential source of diverse stem cells, particularly in heterogeneous populations world over, point to the vast popularity of their storage. The increasing utilization of umbilical cord blood in the treatment of leukemia, lymphoma, and sarcoma, and immunological defects is bolstering the demand for their banking. The promising application of umbilical cord blood in cell therapy research is helping the market to expand rapidly. Furthermore, the market is enormously benefiting from the vast prospect of umbilical cord blood in exploring new stem cell-based therapeutic strategies, both in non-hematological and hematological diseases, especially in developed nations such as the U.S., the U.K., and Germany. Rapid stride made in the arena of cord blood storage and processing technologies bodes well will create lucrative avenues in the market. Governments and several public bodies in various emerging and established economies are embarking upon initiatives to create awareness about the benefits of umbilical cord blood banking. Substantial public funds pouring in numerous developing countries are aiding in the proliferation of the market over the assessment period. In recent years, the market has seen the burgeoning rise in private cord blood banking. These banks are capitalizing on key benefits such as collection site of choice, sweeping ownership rights, and the rising prospect of autologous stem cell transplants. However, the lack of standard and clear public policies pertaining to umbilical cord blood banking in numerous countries world over may restrain market players to realize its full potential. Nevertheless, collaborative efforts to establish clearer international guidelines promoting better use of umbilical cord blood in cell-based research will expand the potential of the market, thereby unlocking lucrative avenues. Advances in cord blood storage and processing technologies aid in the rapid expansion of the market.